One more day and 2014 is over. I don't have anything profound to share (just yet) but I do think that 2014 was an awesome year. Lots of changes, lots of new turns, lots of life-altering-decisions ... but none that I regret (so far!?). In terms of blogging there weren't many changes. There was a routine (even if no one else recognize it) and I stuck to it. 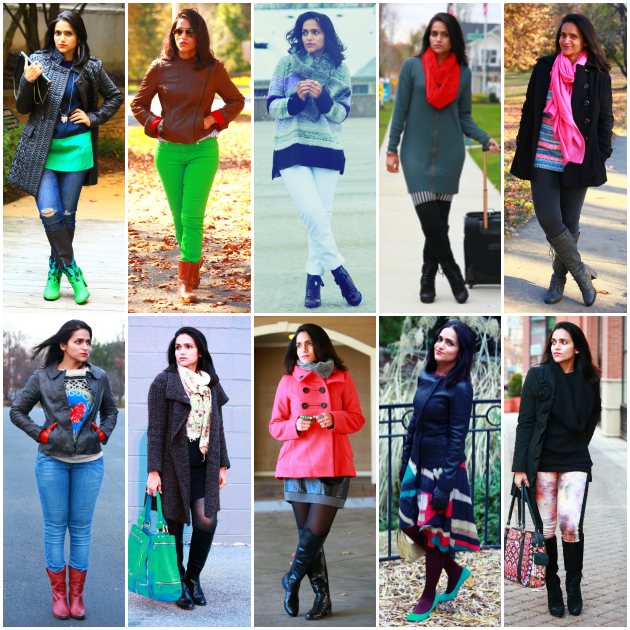 I posted 10 outfit posts each month, with the exception of April & November (posted one in the prior and none in the later). And an average of 5 posts in a week!!! In hindsight it feels like A LOT of blogging. No wonder I was drained out by the end of each month. Going forward I would be tuning down my blogging frequency, else I am afraid I wouldn't be able to keep up and have to shut down. I do not know how many posts I would be able to post but I know for sure that there are definitely some changes coming along. I know that my readers appreciate that I blog regularly and do not disappear on them. Rest assured you will hear from me regularly just not everyday. This is the last post for this year and I would like to thank you all for supporting and being part of my blog. As we bloggers say, without loyal readers it wouldn't be a blog, it would be an online-public-dairy. And that's just weird no-fun! Last but not the least, wish you all a fabulous new year's eve and an awesome New Year in advance!